I just desire to feel the sunshine on my arms and the wind in my face. Have you caught summer fever yet? I don’t have a traditional DIY today, but this one came by complete surprise. Yesterday I was out front, sanding some wood, when my neighbour Janette stopped by for a quick hello. The conversation swung to food, when I voiced my desire that I’d love it if someone could cook gluten free for me. I’m not a foodie and fully admit it. If you held up a power tool or a bag of groceries and a recipe book, the tool would win so fast you wouldn’t have time to blink. Anyway, today at dinnertime, Janette called me on the phone and asked me to come to her front door right away. Leaping into my… bare feet, I quickly tip toed over the rocks and road, not knowing what to expect. I was greeted with foil covering a casserole dish. And inside it was the most amazing, delicious gluten free dinner EVER! I wolfed it down so fast, no salad was even in the picture. Maybe next time… it isn’t every day someone else cooks for you! 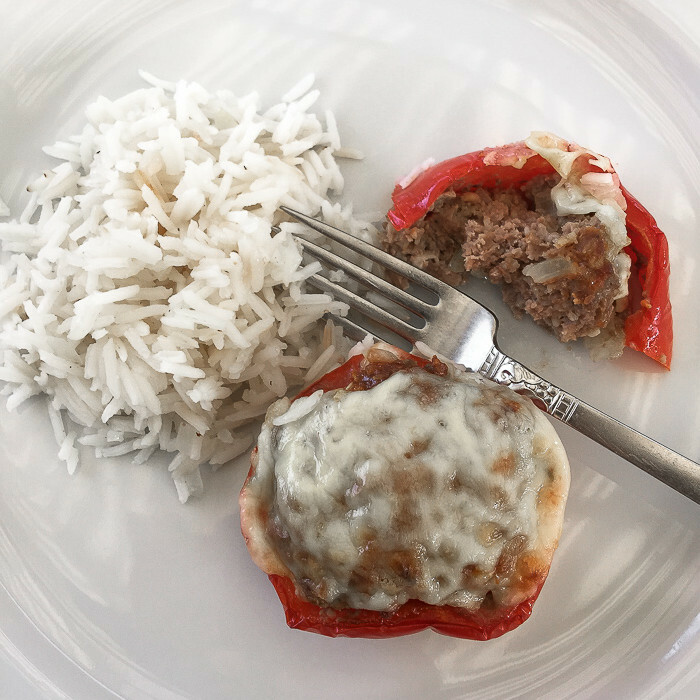 Since posting this on Instagram, recipe lovers desired to know the details.. so today, I bring you Gluten free bell pepper mini meatloaves. So… it’s really like big meat balls topped with cheese, with a slight sweet and sour flavour burst. But I will say, the red pepper ring really struck a chord. It’s so tasty, and wouldn’t be the same without it. 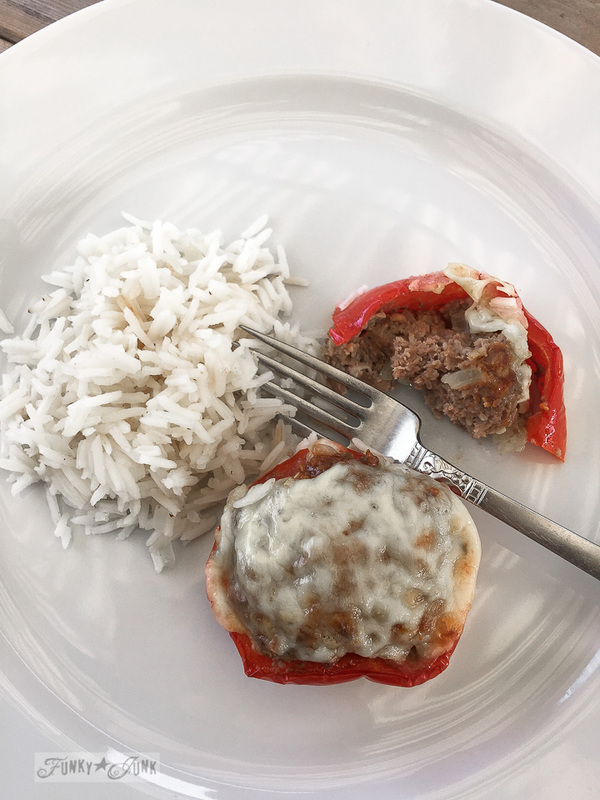 Small, cheese covered meatballs, baked inside slices of bell pepper slices. Delicious! And gluten free! Stuff raw meatloaf mix into pepper slices, and place in a greased 9 x 13 meat loaf pan. Brush a little ketchup / mustard mix on top of each. Optional: Add other desired spices. Bake 350 for 40 minutes. After 30 minutes, slice your favourite cheese, and place on top for last 10 minutes. Serve with a bed of white rice. 2 slices for myself proved to be very filling! This was such a lovely meal, and it came at such an unexpected, perfect time. What a treat! I’m playing with the idea of making her a sign… that reads Take Out / 24 hours. Think it’ll work in my favour?! Yummy!!!! I think I must try this recipe. Thank you for sharing your neighbors love of cooking! What a nice neighbor you have!!! You are welcome Catherine! This seemed so easy to do, and because it was absolutely delicious, it was worth the share! Have really loved your latest posts about the garden. Would you consider doing one featuring all the various plants, vines, etc. You probably feel that is old hat and boring, but lots of us out here in blogland would love seeing up close and personal your plants and bushes, their names and bits about how you acquired them and why, etc. You know….all the stuff you are so great at doing. You thought we’d let the garden stuff go, right? Not so. More. We need more. I’m a little embarrassed to admit, I know very few plant names. So if just a tour of plants is what you’re after, I can certainly do that! Maybe I’ll ask everyone else what they are… great idea, J! Thanks for sharing! So glad it was on a red pepper. I once had a stuffed green pepper and I hated it! What a nice neighbour! Don’t feel bad about kicking back-though of us that live in the pacific northwest/lower mainland have to enjoy every sunny day we can! Kathy, isn’t that the truth?! We get a sunny day and we have this need to sprint outside every chance we get! DO you ever make new stencils? I do Gail! I’m working on several large collections behind the scenes right now, but they take time. I need to design, then test, then create mix and match options. I’ll do a post on how I develop stencil projects, already have that in the works too. Are you gluten-free by choice or for medical reasons? PS: I LOVE your upcycled/recycled ‘junk’ but my husband prefers ultra-modern, sleek and rust-free. So I just sneak it in when he’s not looking! Hi Sharon, I have never had a true blue medical warning about going gluten free. I just adjust my eating when I have issues. I really do think I have problems with grains and gluten. Trying to cut back on dairy and sugar too. Every time I visit the dr, I get told the same thing. Cut out stuff that makes you feel bad. Sticking to fresh protein (meat) and veggies make me feel the best. Donna, check out Angie’s blog: “gluten-free, dairy-free, sugar-free”. She has some amazing recipes (easy) and great advice. My 29-year-old son is gf & df, I am trying to be sugar free. (not easy, as I live for chocolate!). I use lots of her recipes, I think you’ll find good stuff on her blog. And yes, the doctors don’t seem to have a clue or take the time to figure it out, we have to depend on good-hearted bloggers who share their discoveries. My son’s specialist told him, after going gluten-free & dairy-free and still having symptoms, to “experiment” by eliminating different foods. He’s still struggling, a decade later. Someone recently told me about something called FODMAP diet. It’s basically about different kinds of sugars that the foods break down into, and avoiding certain ones. It’s really an elimination diet, and although I haven’t tried it yet (very restrictive), it might be what your son is after. OMG…this looks soooooo GOOD! 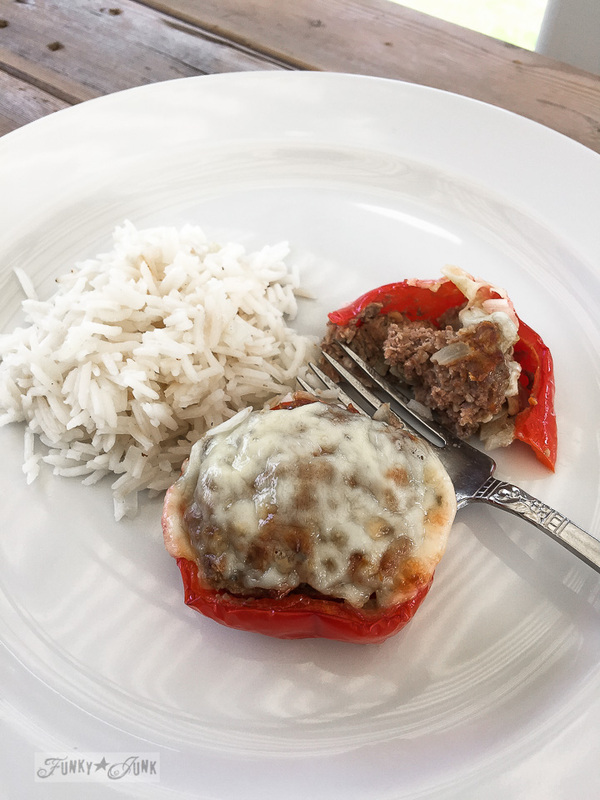 I am crazy for bell peppers of any colour…when I see them on sale, I go bananas for them…I actually do a happy, happy, joy, joy dance in the aisle and then pile them into my cart…so I’m going to have to try this recipe! That’s a fantastic friend you have there…a real keeper! I like to keep things light during the summer. Probably my fave thing to eat is grilled salmon over a mixed green salad with peach poppy seed dressing. I like this because you can switch it up and add whatever you like…avacado, apple, sundried tomatoes, cashews, pumpkin seeds etc. and it’s not too filling. I’m not quite in summer mode yet…I might be able to achieve that when I can get rid of all of these weeds and have time to relax outside. Got my book list at the ready for this time! I LOVE salmon!! I BBQ it wrapped in foil with lemon slices, spices and a little butter. It’s on my shopping list now. Looks really good! I will have to pass this along to a couple of friends of mine who have to go gluten free. You are blessed to have such a sweet neighbor!